Recognizes a protein of 42-46kDa, identified as MAGE-1. This MAb does not cross-react with other members of MAGE-family. Human malignant neoplasms carry rejection antigens that are recognized by the patients' autologous, tumor directed, specific, cytolytic, CD8+ T lymphocyte clones (CTL). The MAGE family of genes codes an important group of antigens. It was identified that melanomas, primary glial brain tumors express common melanoma associated antigens (MAAs). 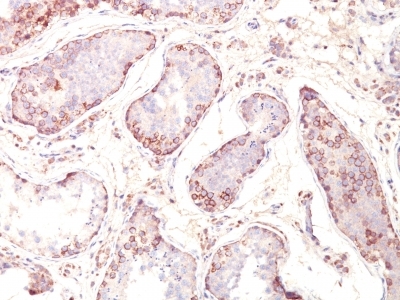 Because MAGE-1 is expressed on a significant proportion of human neoplasms of various histological types (melanoma, brain tumors of glial origin, neuroblastoma, non-small cell lung cancer, breast, gastric, colorectal, ovarian, renal cell carcinomas), not on normal tissues, the encoded antigen may serve as a marker of early detection, target for cancer immunotherapy. Anti-Human MAGE-1 Positive Control Sample: Melanoma cell lines. Melanomas, gliomas, neuroblastoma, non-small cell lung cancer, breast, gastric, colorectal, ovarian,, renal cell carcinomas. Anti-MAGEA1 antibody staining is expected to be primarily localized to the cytosol. 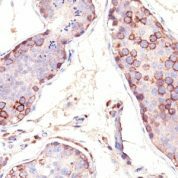 Variations in MAGE-1 antibody staining intensity in immunohistochemistry on tissue sections are present across different anatomical locations. An intense signal was observed in cells in the seminiferous ducts in testis. 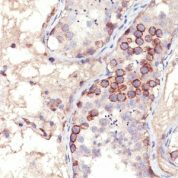 More moderate antibody staining intensity was present in cells in the seminiferous ducts in testis. Low, but measureable presence of MAGE-1 could be seen in. We were unable to detect MAGE-1 in other tissues. Disease states, inflammation, and other physiological changes can have a substantial impact on antibody staining patterns. These measurements were all taken in tissues deemed normal or from patients without known disease. enQuire Bio's MAGE-1 Anti-Human Monoclonal is available for Research Use Only. This antibody is guaranteed to work for a period of two years when properly stored.